My first conversation with James Ellroy was in June 2008. I’d written to him, through his publisher, explaining that I had recently begun studying for a Ph.D. on his life and work at the University of Liverpool. I wanted to ask him a few specific questions about The Big Nowhere (1988), an outstanding novel which rivals his more well-known masterpiece, The Black Dahlia (1987), as his greatest work. I did not expect a prompt response for two reasons: I thought Ellroy must be flooded with correspondence from fans (and one or two lunatics), and he has such a prodigious output that I was sure he was too busy to spend much time with such requests. To my surprise, in a short interval I received an e-mail reply from Ellroy, through his assistant, answering my questions and also giving me his phone number and suggesting that I call him if I had anything further to ask. This led to three telephone interviews in which Ellroy proved to be at turns generous, courteous, combative, outrageously funny, and thrillingly insightful on a whole range of subjects--everything from his life and career to his crime-fiction influences and his views on politics and religion, delivered sometimes with the canine-like howling which has become a trademark of his “Demon Dog of American crime fiction” persona. Beyond their being invaluable to my research, I wanted those interviews to be shared, because I found them both interesting on a personal level and academically engaging. After discussing the matter with my thesis supervisor, professor David Seed, we both agreed that the best way for the interviews to be published would be as part of the University Press of Mississippi’s Literary Conversations Series. That series offers interviews with the most prominent figures in 20th- and 21st-century literature, each volume focusing on a single author and comprising conversations conducted over the full breadth of his or her life and career. More than 100 volumes have been produced so far on figures including Ernest Hemingway, Norman Mailer, Tennessee Williams, Gore Vidal, Anaïs Nin, Elizabeth Bishop, Joyce Carol Oates, Graham Greene, and Walter Mosley. I felt it would be a privilege to edit Conversations with James Ellroy as part of that series. After making a pilgrimage to the James Ellroy archive at the Thomas Cooper Library, University of South Carolina, and interviewing Ellroy in person at his Los Angeles apartment, I decided it was time to pitch the book. I contacted the series editor, Peggy Whitman Prenshaw, and through her Walter Biggins at UMiss Press, and after some helpful discussion, we agreed to go ahead and make Conversations with James Ellroy the best book it could possibly be. UMiss Press armed me with a modest budget for buying copyrights, and I was ready to roll. 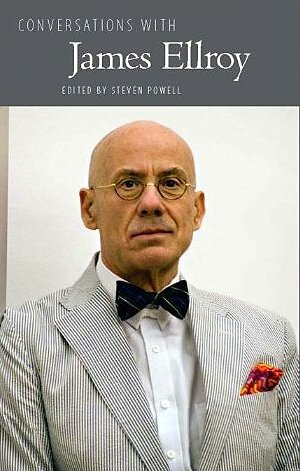 As editor of this volume, I had two main tasks: to secure the copyrights of the interviews to be included, and secondly, to write a chronology of the key events of Ellroy’s life. Writing that chronology entailed carefully reading through primary and secondary sources on the author, a task made more difficult by the sources’ conflicting dates of events. However, the arduous process unearthed some research gems. I only discovered that Ellroy’s preferred title for his first novel, Brown’s Requiem (1981), was Concerto for Orchestra after I visited the Ellroy archive in South Carolina. Nor was I aware that Ellroy had planned to make Frederick Underhill, the lead protagonist of his second novel, Clandestine (1982), a character in 1992’s White Jazz (presumably filling the role that went instead to Dave “The Enforcer” Klein) until I listened to Ellroy’s 1987 radio interview with Book Beat host Don Swaim, which appears in print for the first time in Conversations with James Ellroy. The author recalls the circumstances of his mother’s death, in 1958, for the documentary James Ellroy: American Dog. Naturally, there were several excellent interviews which couldn’t be included due to space constraints, and it was a tough call having to choose some at the expense of others. However, as the interviews are arranged chronologically, my general aim was for each of them to tell a part of Ellroy’s life story. The unsolved, 1958 murder of his mother, which has haunted him throughout his life, is explored in some detail in the volume, but there are other less well-known incidents which the author discusses, in some cases as they were happening. Ellroy had a nervous breakdown during the grueling publicity for The Cold Six Thousand (2001). In reading Ellroy’s interview with Craig McDonald conducted around that time, it is apparent the author is struggling with his own image and success. As Ellroy tells McDonald, “I’m tired of myself, if you want to know the truth.” Ellroy’s sometimes-turbulent personal life, as the interviews attest, informs the narratives of his novels and even changes his writing plans. The breakdown of his second marriage and his affair with the enigmatic “Red Goddess Joan” caused him to radically revise his latest novel, Blood’s a Rover (2009), which forms the subject of his interview with fellow crime writer David Peace that closes the anthology. However, with the news that Ellroy is planning to write a second “L.A. Quartet,” and the recent release of the Ellroy-scripted movie Rampart, there are still more chapters to come in the life and story of one of the most remarkable figures in American crime fiction. For James Ellroy, the conversation continues. READ MORE: “James Ellroy on Writing About His Mother’s Murder and Why His Novels Will Always Shock,” by Rob Waugh (The Daily Mail). Jeff, does that photo look familiar? I think that's the year you sponsored me for a press pass at LA Times Festival of Books. Yep, Mark, I recognized it right away. I hope you made a few bucks off the photo loan. I usually put all my author photos in the public domain, so no $'s required. Hopefully, I did get a credit, though ;-). Sounds interesting. Better the writer speaking than a biography.